Who knew that rope-tying could be such a beautiful art form? I didn’t, until a few years ago when I discovered modern macramé - a form of textile, or fiber art, where you create patterns by tying cords together. Elsie Goodwin of Reform Fibers decided to be a Stay at Home Mom when she had her first daughter six years ago. She was looking for a way to keep her hands and mind busy. Two years into motherhood, she discovered macramé and taught herself the craft from YouTube videos. 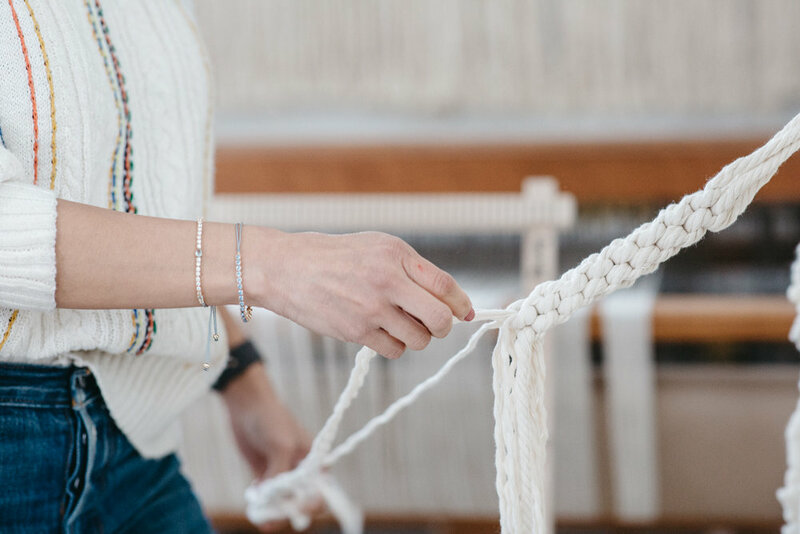 “What I loved about macramé was that unlike knitting and crocheting, the rope is thick, so the projects come into form much faster. So I was able to do substantial projects during nap time or before they were awake in the morning. 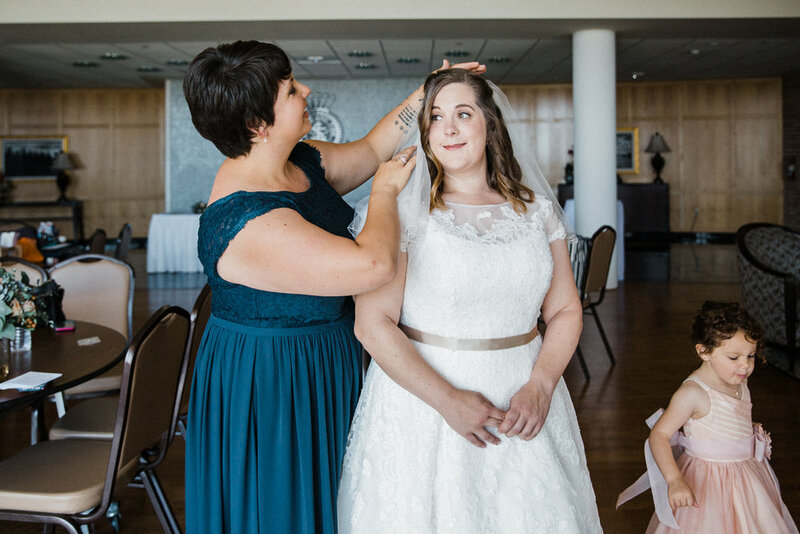 “I had experience recognizing and reading patterns because of my experience with knitting and crocheting for almost 20 years before I picked up macramé. I realized that there were not many modern patterns out at the time. You saw a lot of the vintage pieces, but there weren’t a lot of patterns out there that would go with modern homes. I saw it as an opportunity to write my own patterns. “Initially, I tried to use everything - rope and yarn, crocheting within macramé… hand-dyeing yarn, (which was really time consuming) etc. And I even did some weaving and took a weaving class for a year. I love the art form, but I quickly realized that I have too many ideas and not enough time. By the way, the floor loom in my studio is for weaving. 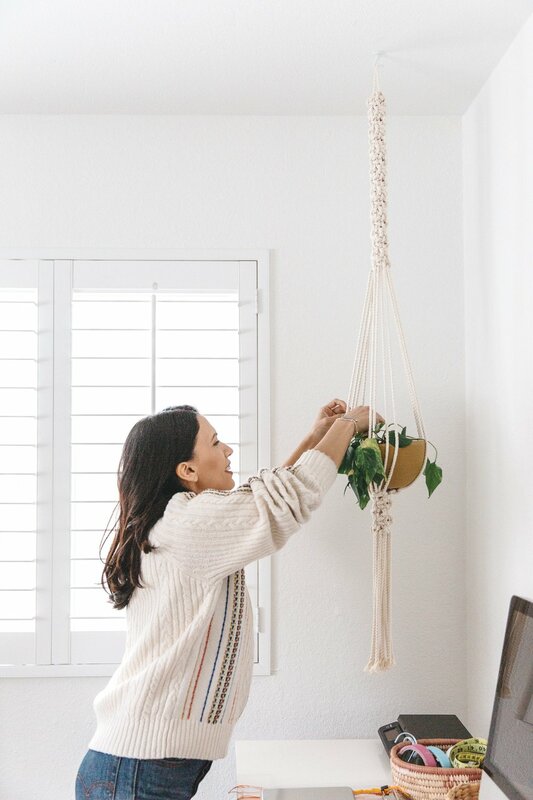 Macramé doesn’t require extensive equipment. So I realized I need to focus on the things that are most fulfilling for me and that is macramé. So now, I am more attracted to clean looks lop and the natural colors of the rope and I don’t hand dye them anymore. Have you tried throwing two parties in one day? That’s what Fashionista and Blogger Chriselle Lim did with the help of her team for Chloe’s 4th birthday and Colette’s 100th day bash. That’s right. 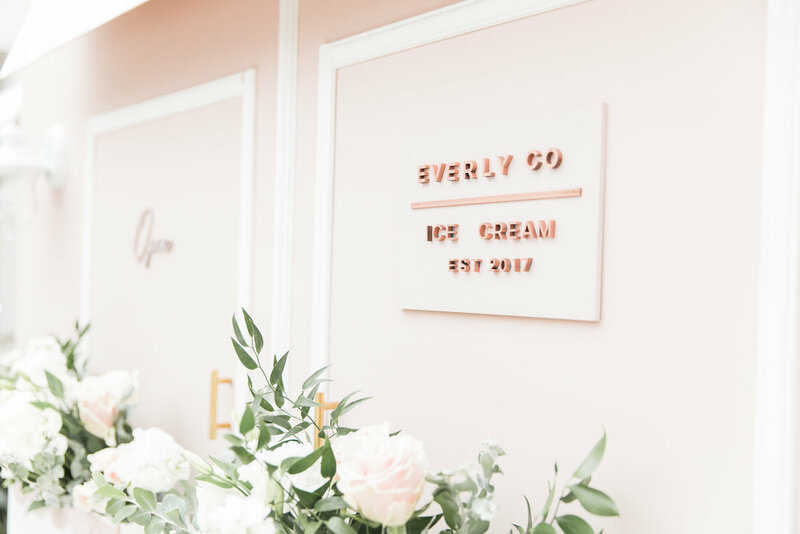 Two cakes, two dessert tables, two name signs, and one amazing time! 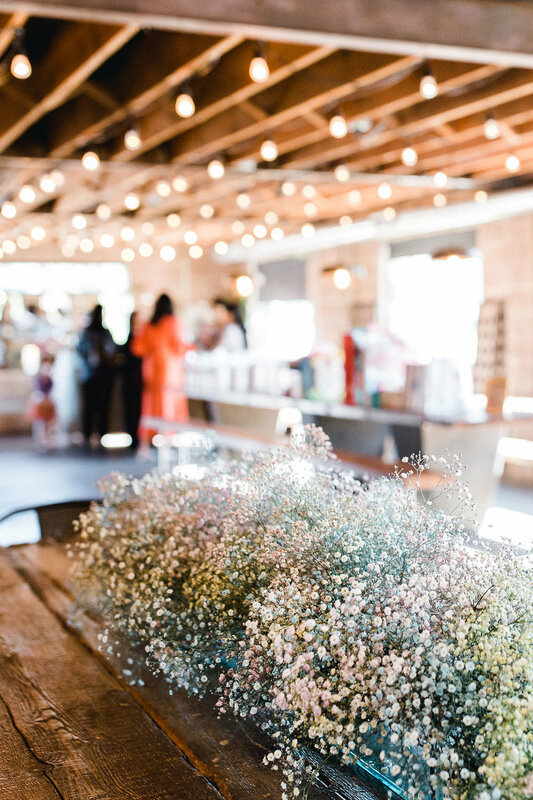 This unicorn themed party had blush pink, purple and blue hues sprinkled everywhere with balloons and colored bunches of baby’s breath that reminded me a magical fairy dust. There was plenty of entertainment for the kiddos with face painting, petting zoo, ball pit, and yes, unicorn themed bounce house. Everyone seemed to have a great time, especially the birthday girl. So much so, that I could barely keep up with her. Background info: Chriselle’s team warned me that Chloe “hates taking pictures.” I’ve worked with a fair share of uncooperative kids, so how hard could it be, right? Let’s just say … they were not exaggerating. And when I realized this isn’t going to be easy trying to capture the birthday girl, I’ll admit, I wondered if I could do my job as the official photographer. 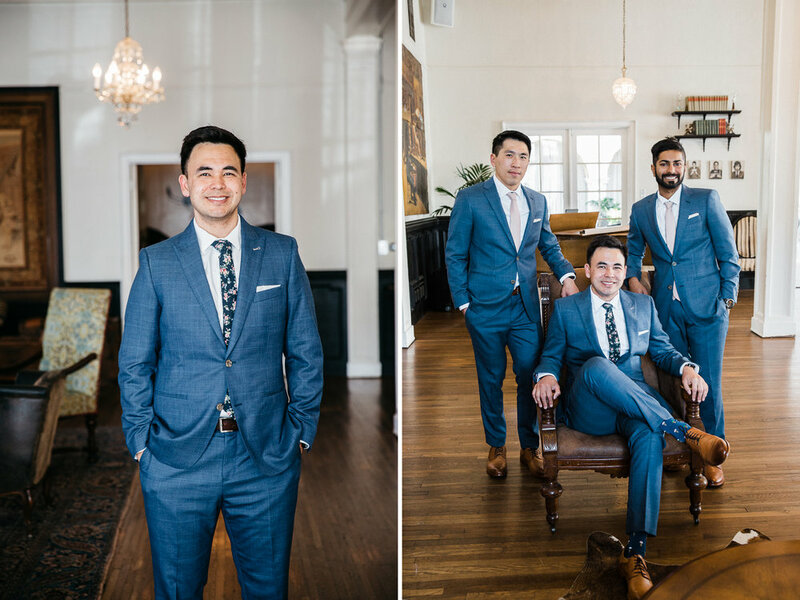 Thankfully, we were able to get a few shots. Phew! But I think what quickly put me at ease was seeing how Chriselle had realistic expectations. She was also… normal. Don’t get me wrong. She’s freakin’ exceptional at running multiple successful businesses and projects. When I say normal, I mean she’s down-to-earth, approachable, and lovely. The first birthday is a big deal. As a parent, I know how hard that first few years are, but I know that the sleepless nights and throw ups and meltdowns are worth it for this family. All the family members were gushing over Everly! There is so much love poured out at these gathering. Everly, I hope you grow up to share the immeasurable love you will receive from your family and friends! Have you seen a couple so madly in love with each other that they just can’t keep their hands off each other? 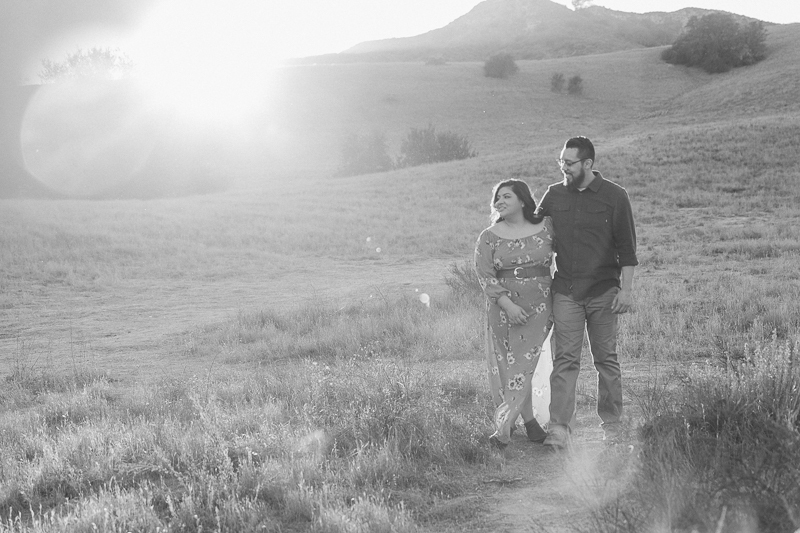 That was how Eric and Christina were at the engagement session. It also helps that they are just playful with one another and could make each other laugh with tiny mischievous twinkle in their eyes. I love how this couple did things their own way. 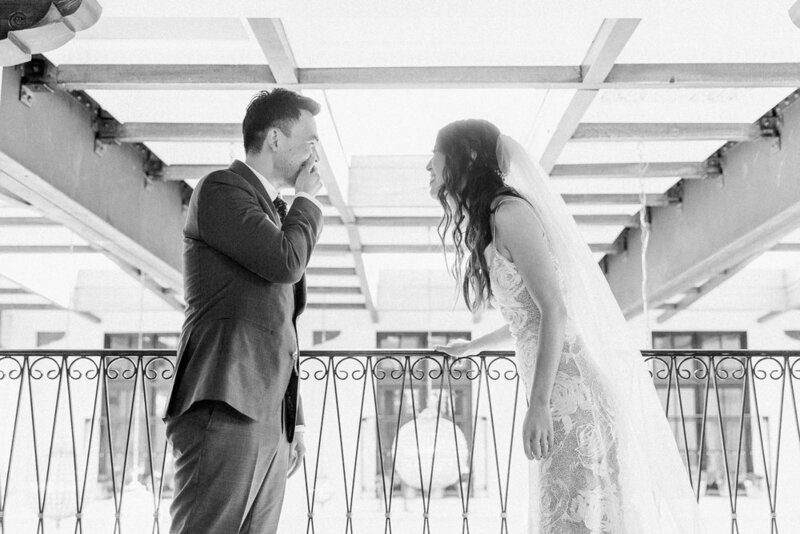 They had an intimate ceremony with family at the Beverly Hills Courthouse. 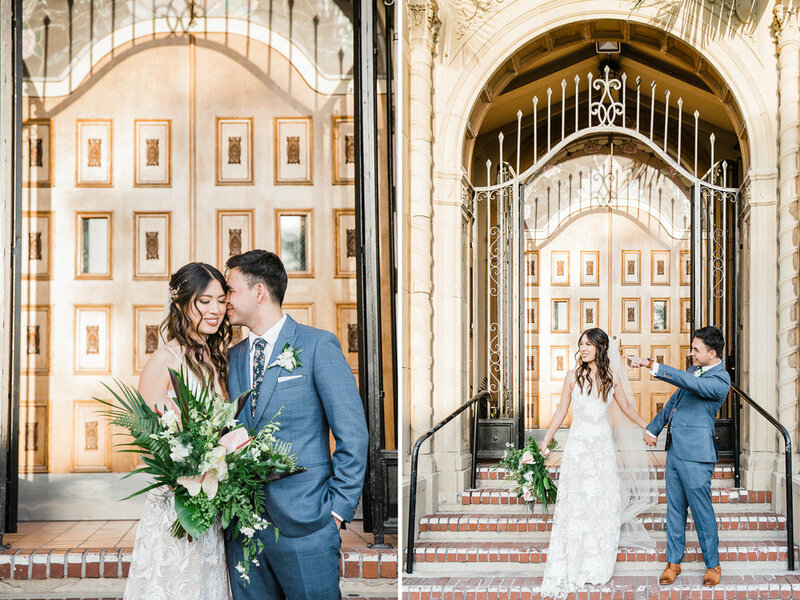 Then, they went over to the GORGEOUS Greystone Mansion for photos. 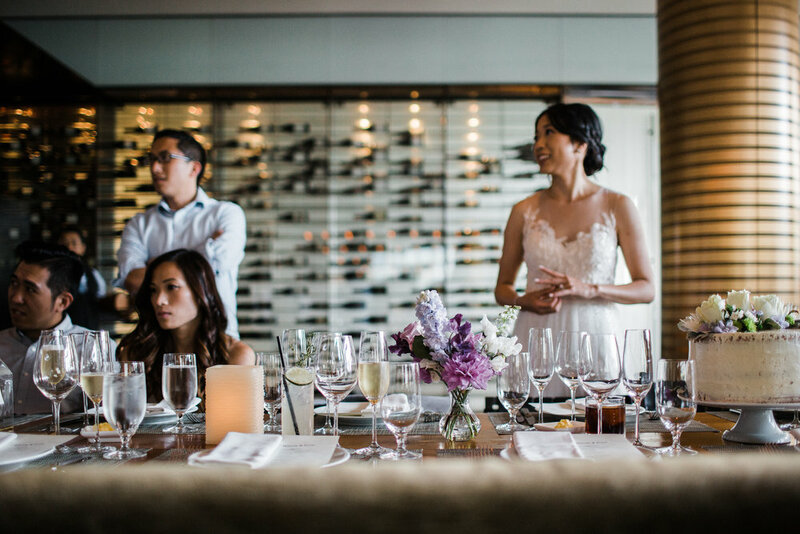 Finally, they had a family style reception at Craft LA Restaurant - all the locations being a few minutes drive from each other. Everyone was easy going and just enjoyed the time together. During my time with them, I could tell that Ernie was the protector. 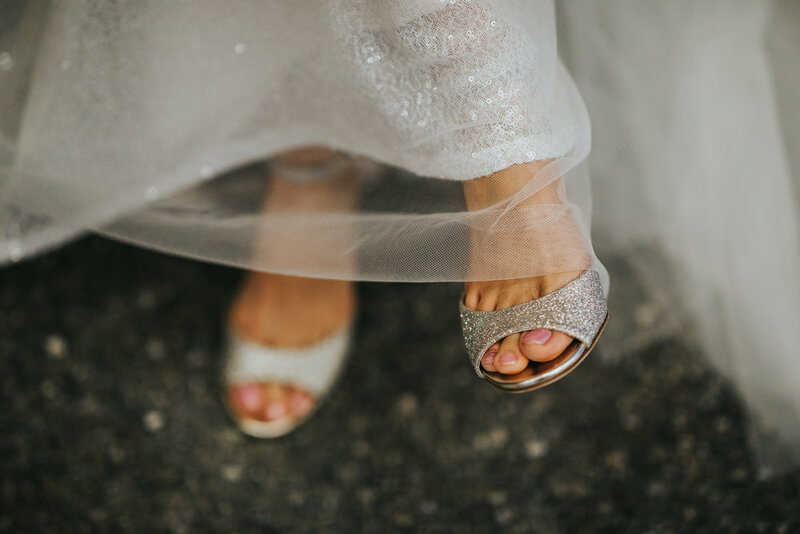 He took care of his bride from the smallest details of helping her with her shoes without being asked to making sure all the details of the day was organized. I hope that this love continues to grow deep! 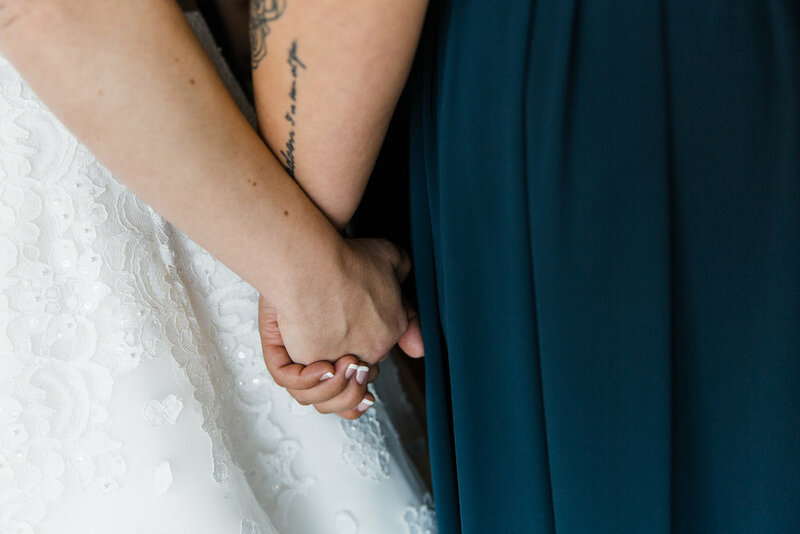 They met while training to become ministers in The Salvation Army’s College for Officer’s Training. 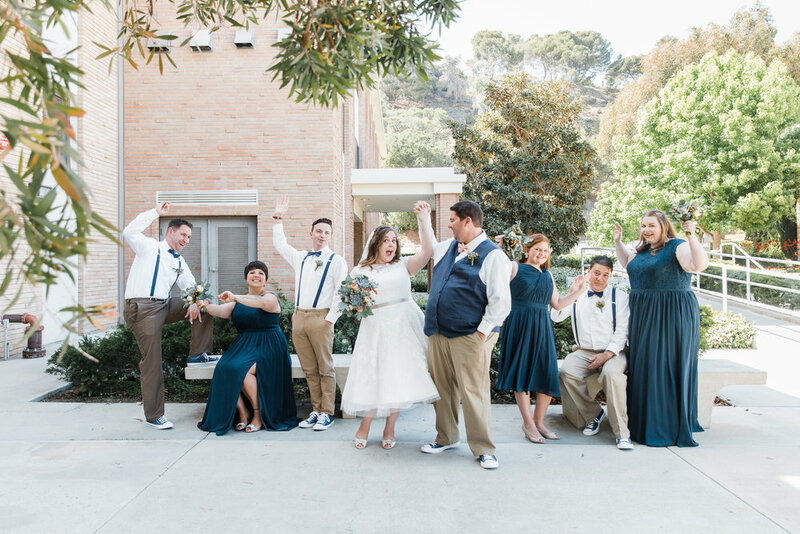 A few days after graduating, the bride, Shelby and her groom, Brian tied the knot at the college campus. They both have a huge heart for others and serving their community. 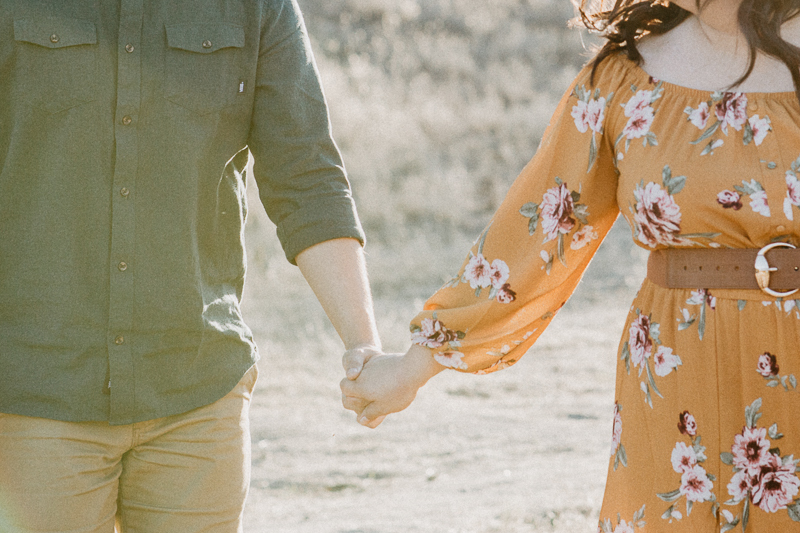 With their love rooted in their faith they built the foundation of their marriage on the sacrificial and unconditional love of God. 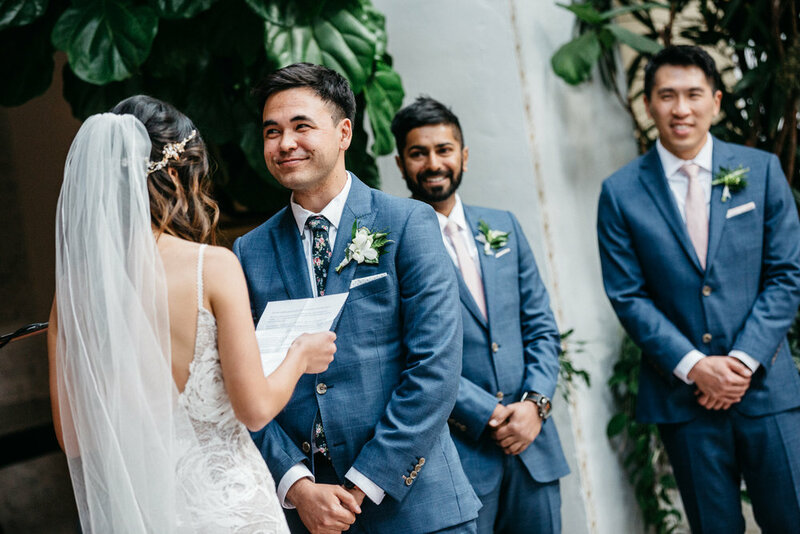 The bride wore a cute mini length dress, covered with lovely lace and all the men went without jackets - a wise move for a summer time wedding! There was fun and laughter, but the emotion that was most evident in the day was deep gratitude. Let’s play a word association game. What image comes to your mind when you hear the word “ceramics”? Let me guess. Did you think of clay spinning on a potter’s wheel? Some of you may have even thought of the movie-post worthy scene from the movie Ghost. While the use of a potter’s wheel is commonly associated with pottery, there are other ways to create pieces out of clay. Andrea of Luna Reece Ceramics is a ceramics artist in Costa Mesa, CA. 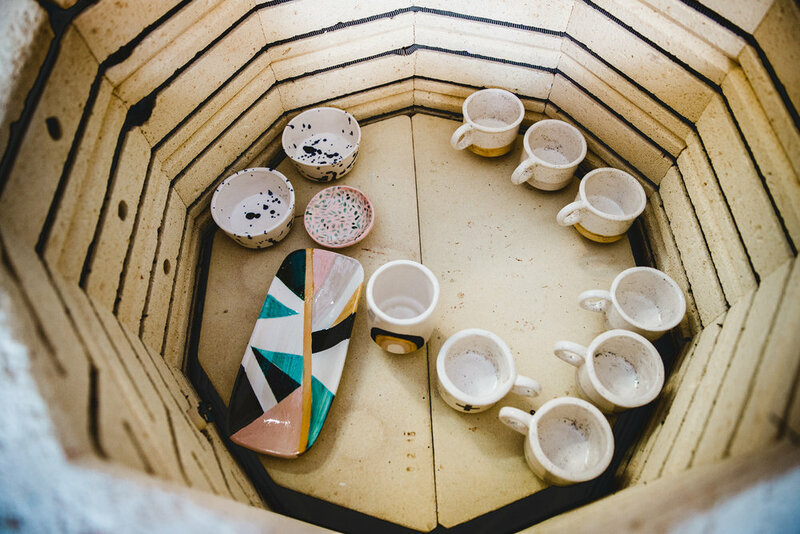 She creates fresh, whimsical and modern handcrafted pieces out of clay using, yes, the potter’s wheel at times, but mostly with casting molds and by hand. When she was 7 or 8 years old, she got a toy potter’s wheel. She was hooked and took ceramics in high school. She’s always been a creative kid - always drawing and painting. When she went to college, she thought she was going to be a drawing and painting major, but when she got took her first ceramics class, she knew that clay was going to be her medium of choice. 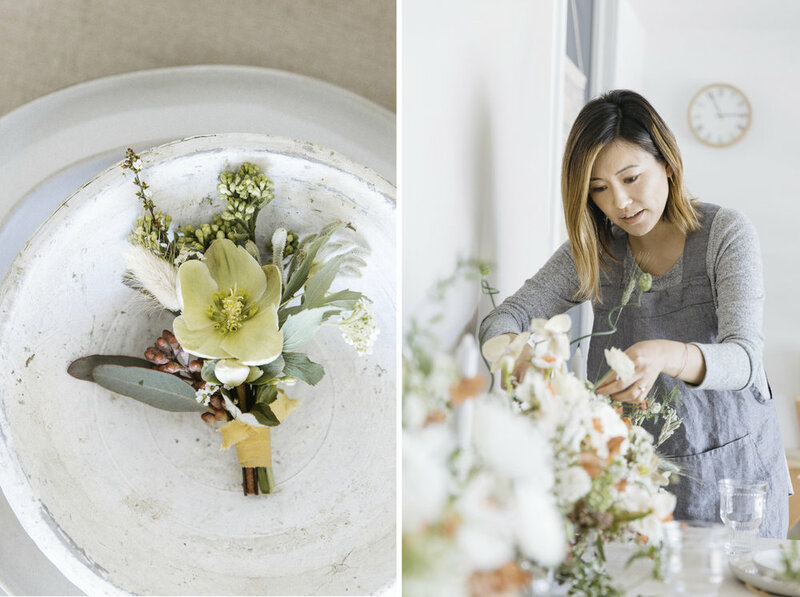 She ended up graduating with a BFA with a focus in Ceramics. I thought this was a regular job I was supposed to do. It was safe. I didn’t really think of becoming an ‘artist’ even with a degree in art. But I realized after a few years that I really missed my art. I missed having that creative outlet. So I quit my job and started creating again. I started with painting because it was the easier to set up, but after a while, I realized that I missed working with clay so I started doing ceramics again. When I pursued my art again, I did it without any agenda for it to become a business. I created to simply create. 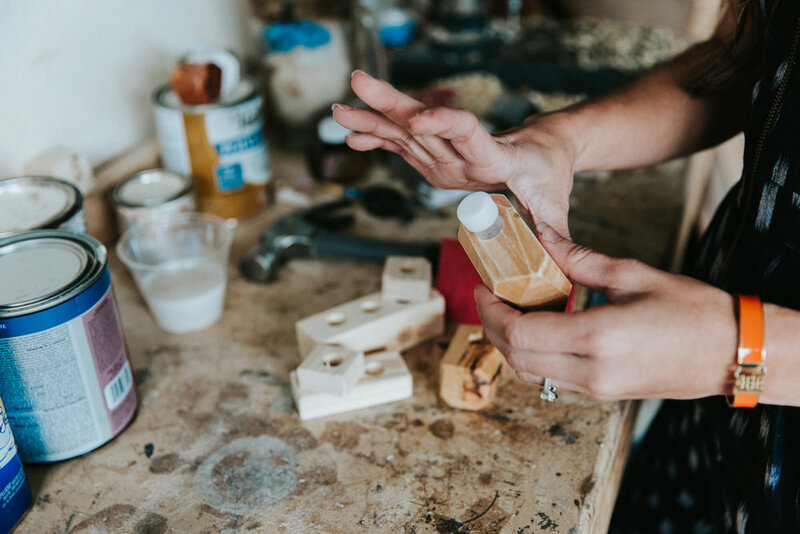 There was a breakthrough moment when I got into a craft show and began selling items in shops so the growth into a business happened organically and over several years. I’ve done other forms of art, but I seem to always come back to ceramics. I love the feel of the clay in my hands. I’m very drawn to that aspect of it. With clay, it’s so tactile and I’m forming something with my hands. And after all these years, I still get excited when I open my kiln up. I’m like a kid at Christmas because I’m excited to see how each piece turns out. What kinds of misconceptions do people have about ceramics? Pottery is a long process. It takes several days to dry. It takes another 24 hours to fire it. And then there’s another glazing process. For one piece, although you create multiple pieces at the same times, it takes about a week or so. The process also depends on the weather. If it’s cold or wet it takes longer to dry and if it’s too hot then it can crack. People think, that you just throw it on the wheel and it comes out, but it takes time. What do you consider to be beautiful work in ceramics? I love all types of work with clay. When I go to the supply store, I have to touch it and feel the different clay and tiles. I look at piece and wonder how thick or thin did the potter wanted this piece to be. I also love the handmade quality of a piece. For the hand built pieces or even in painting the pieces, each of them look slightly different. The edges aren’t perfect. It’s not mechanical. There are bumps and grooves that give it an organic, human touch. 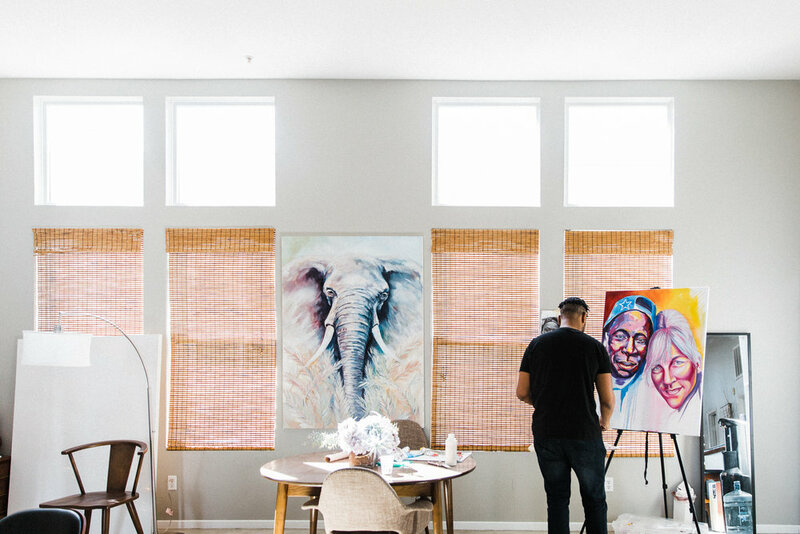 On her website, she shares her vision and heart, "I want people to have a piece that brings them joy so I try to design and execute pieces that are modern, fresh and can add life to a space. Light is the inspiration behind my paintings... the light that shines out of the fractured and the broken." It’s satisfying knowing when you are doing what you’re meant to do. 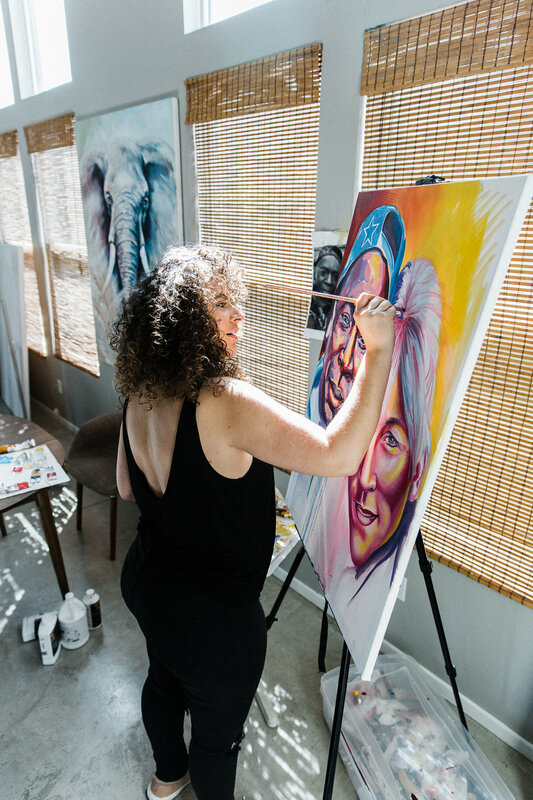 For Andrea, she has a deep connection to creating… a gut feeling, a passion that calls her to create. Parenthood is not easy. With a new gorgeous baby in their midst, Chris + Chelsea are pouring all of their love and energy into this little one. Drools, diapers, and all! 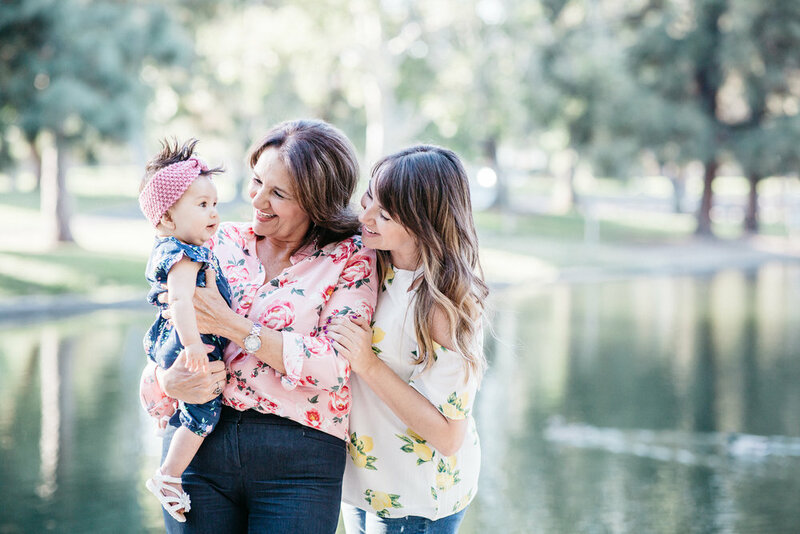 Three generations of strength. It is moving to see women pass on values, habits, and traditions... to see women raise one another up, helping one another. Right now, mom and grandma are raising Ellie, but one day, I'm sure little Ellie will help mom and grandma in their journeys too. 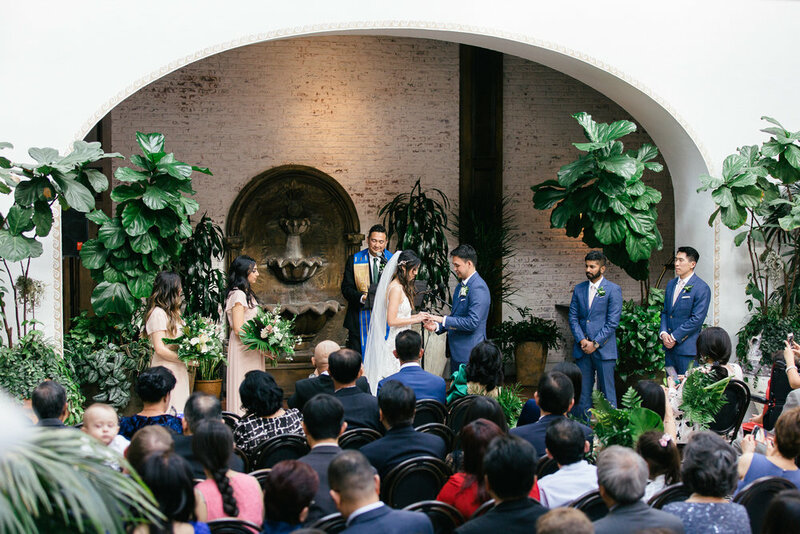 Randy + Stephanie describe their wedding as an event with a modern bohemian tropical feel. 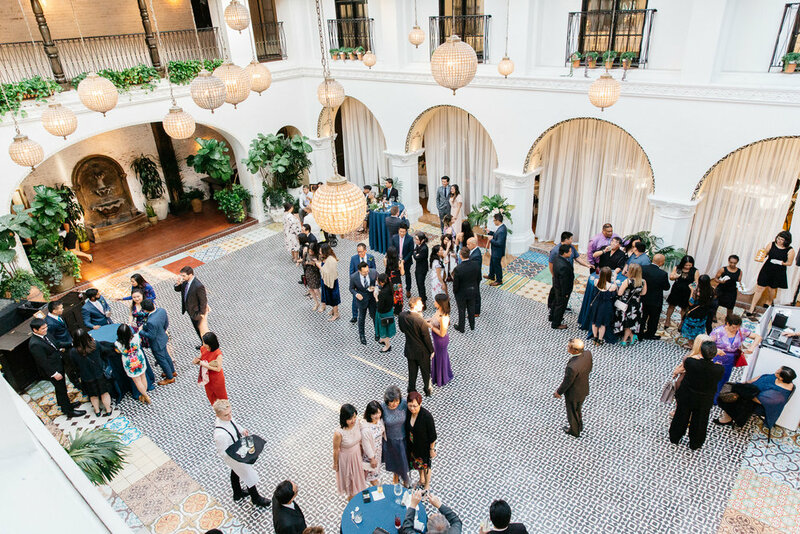 "We found Ebell after looking into a sister venue in Los Angeles, and visited Ebell after learning that it had a larger guest capacity. 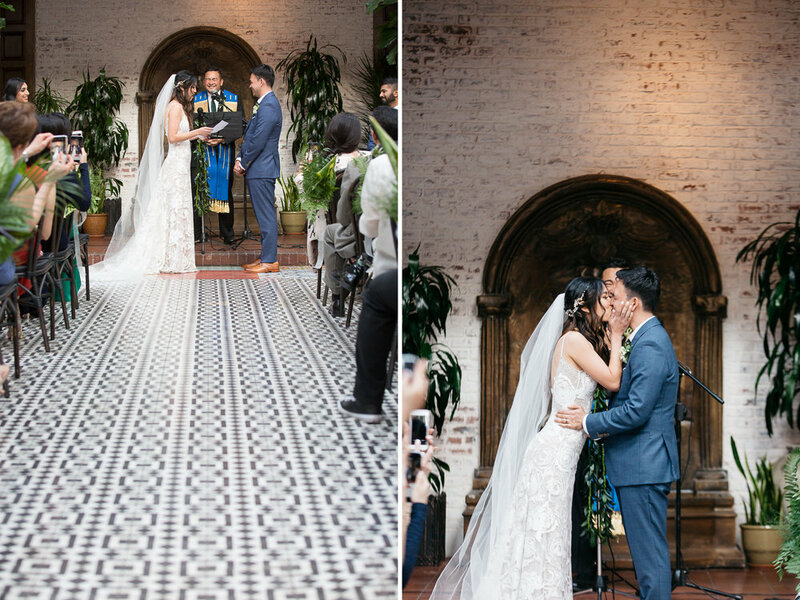 When we got there, we fell in love with the greenery, the Spanish tile, the flow, and all of the natural light. 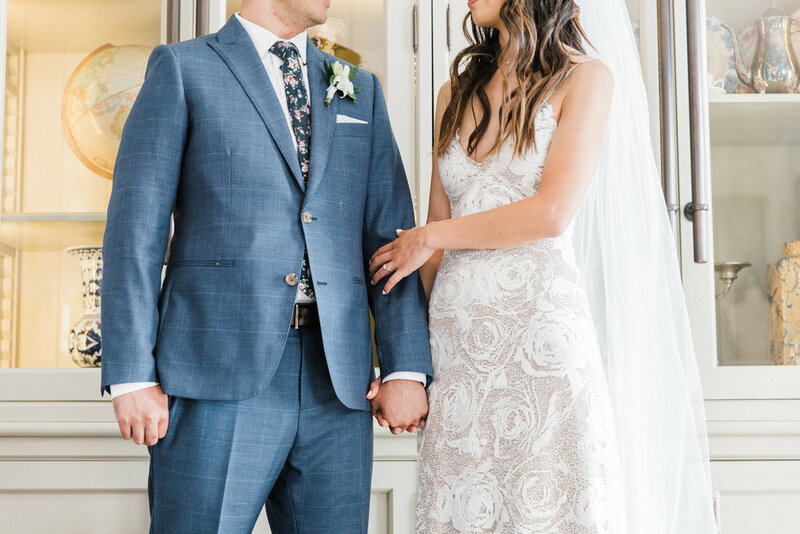 There was a definite wow factor without being too formal, that made us feel like this was the place we should get married in." 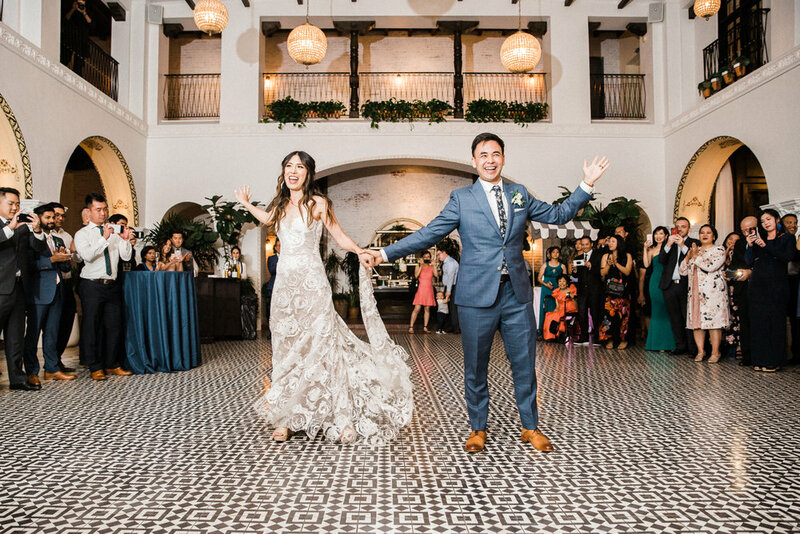 Randy + Stephanie met online through Coffee Meets Bagel. (The same app my husband and I used to find each other!). 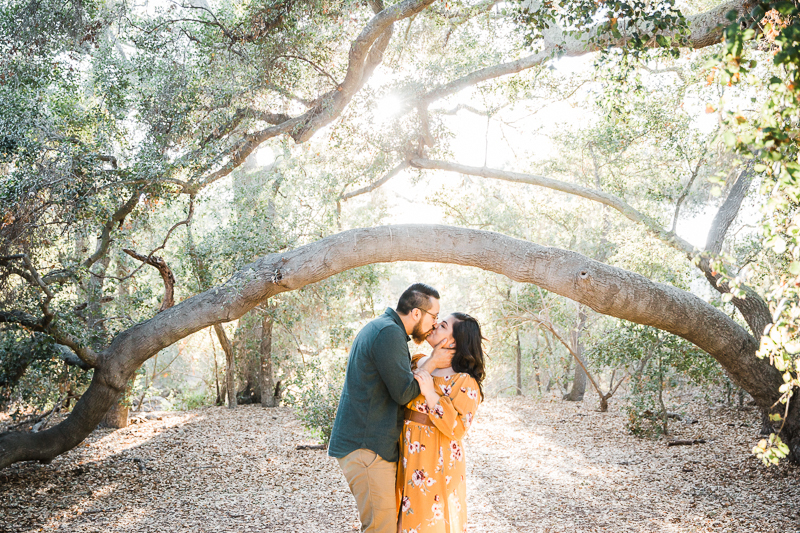 On their second date, they went on a long hike to Muir Woods. Her friend warned her that it might not be the best idea since we don't know if this guy is a serial killer or not. :) But Stephanie came back from that hike with her face hurting from smiling so much. Far from a serial killer - this guy was more like an innocent teddy bear! 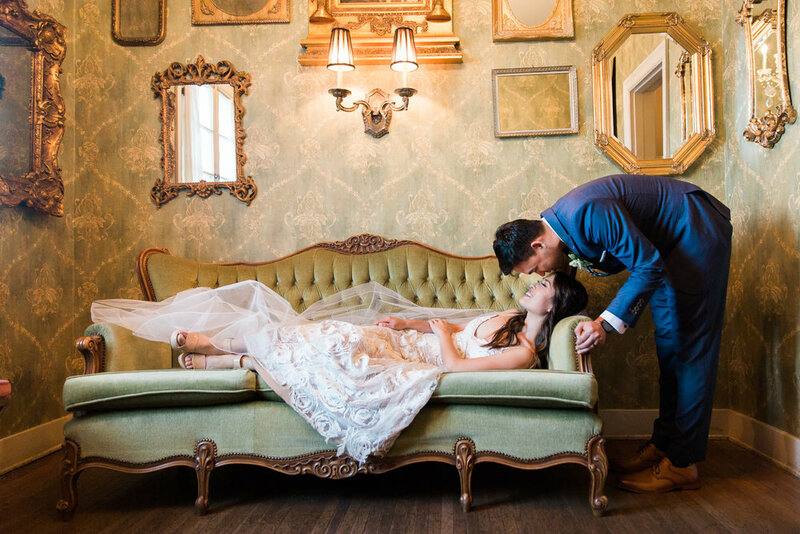 This couple is laid back, smart and so personable. They are loyal to their friends and family and there was nothing but love being poured out that day! 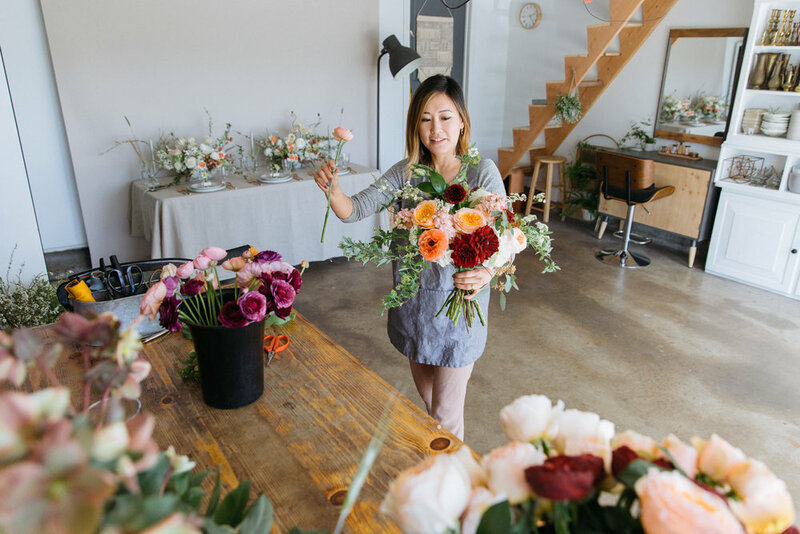 Milieu is a French word (pronounced mil-yOO) which means ‘atmosphere, surroundings or environment.’ It’s the name Hannah Koo took on for her flower business because she truly believes that flowers have the ability to shape and transform the atmosphere. Beautiful floral designs can evoke strong emotions and set the tone. Speaking of “milieu,” (yes, please do say it with a French accent and a beret) Hannah grew up in a creative milieu. She paints and her educational background in college is in studio arts (UCI) and jewelry design (OTIS). Her mom did flower arrangements on the side and her dad was a landscape artist. “Maybe that’s why I was so drawn to being creative with natural things,” she said. 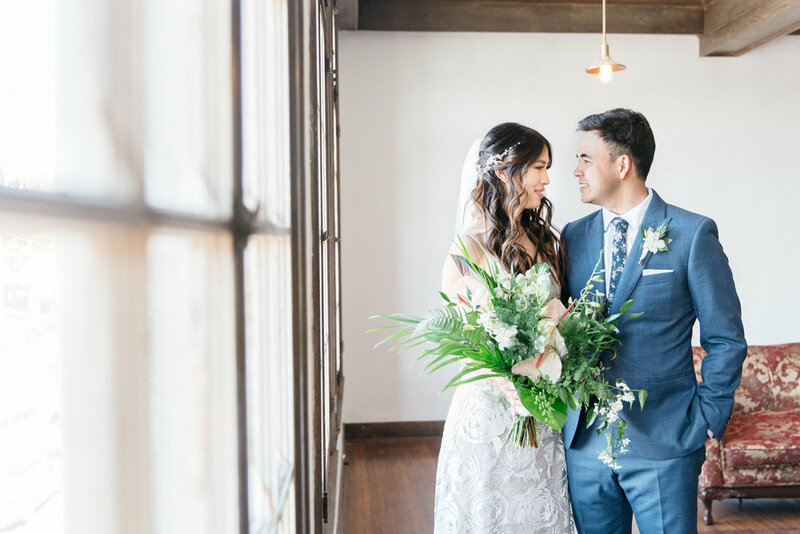 She started working in the floral business 15 years ago when she worked at a flower shop. 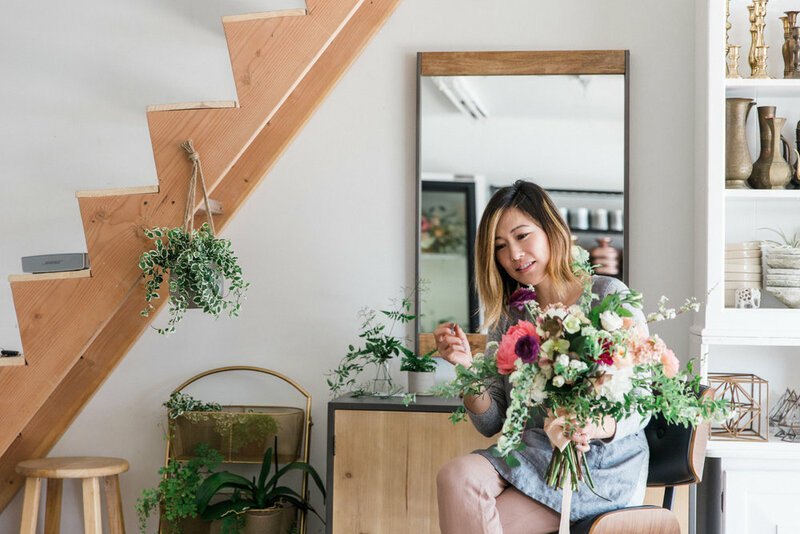 "When I first started working at a flower shop right after college, it was intended to be just a part time job to save up enough for travel & prepare for Grad School for the Arts. However, within the first week of working there I fell in love with the whole business aspect of it. The idea of owning your own shop, so I ended up staying there for 5 years, soaking up everything it took to run a business. For the first 2 years, I didn't do any design work but was assigned to just cleaning buckets, processing flowers & menial shop duties. I really worked my way from the ground up." 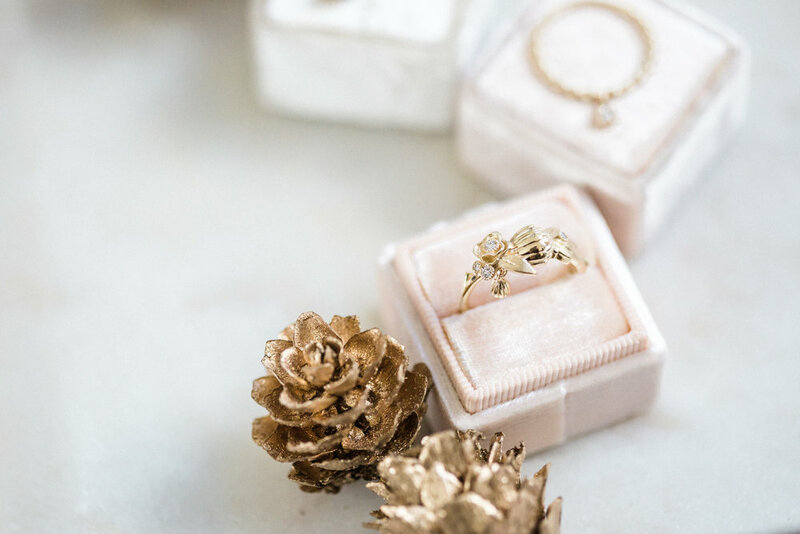 She is now in her 10th year as the owner and designer of Milieu Florals. Her floral designs have always had a very natural and organic feel to it, even before the “natural and organic” designs were popular. And maybe her background in painting contributes to her approach to her floral work. 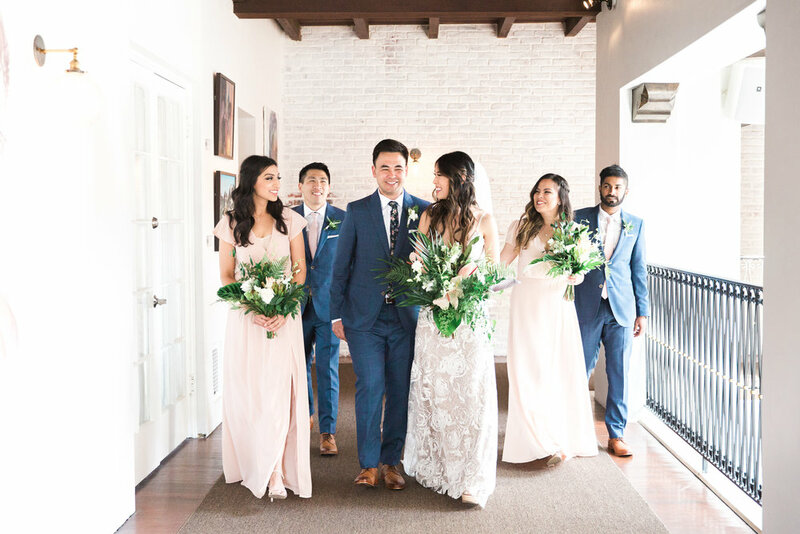 "I work with the color palette rather than the variety of flowers, so I will sometimes use different textures that aren't necessarily flowers, like fruits, branches, and acorn to stay true to the color scheme & feel for the event." 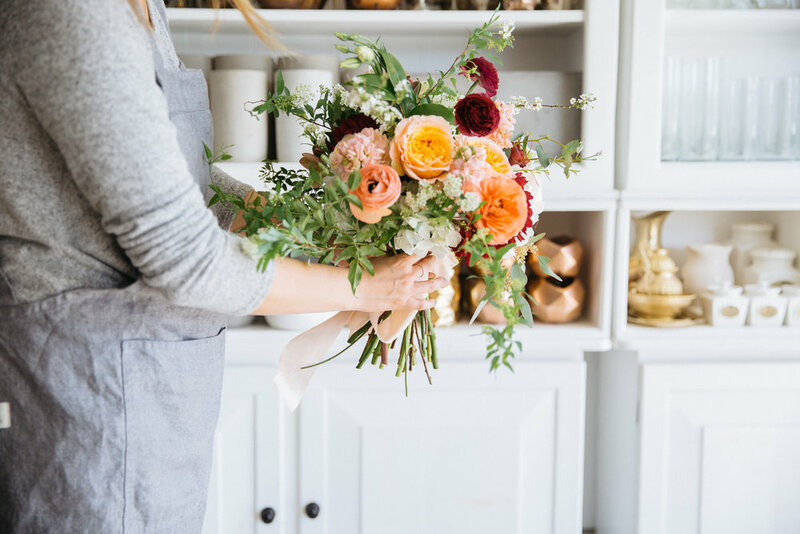 What’s something you would do different in your journey as a florist? I would probably pick a name that people can pronounce [laughs]. I would be more ok saying, “no” to work and be more selective with the amount of work I took on. It led to feeling burned out at times because I sometimes took on 60+ orders per year. Now, I feel like I’m finally at a place where I do have the freedom to be more selective in my work and give myself more time for myself and my family. I love being able to make people happy and how flowers can change the ambiance of a space. I love the flexibility of my work. I like working Wednesday - Saturday, even though I sometimes work 15+ hour days. Before, I would try to take all the work that came in, but now I’m finally at a place where I have the option to say yes or no. What aspects of floral design is least expected by a typical person who may not be familiar with what you do? 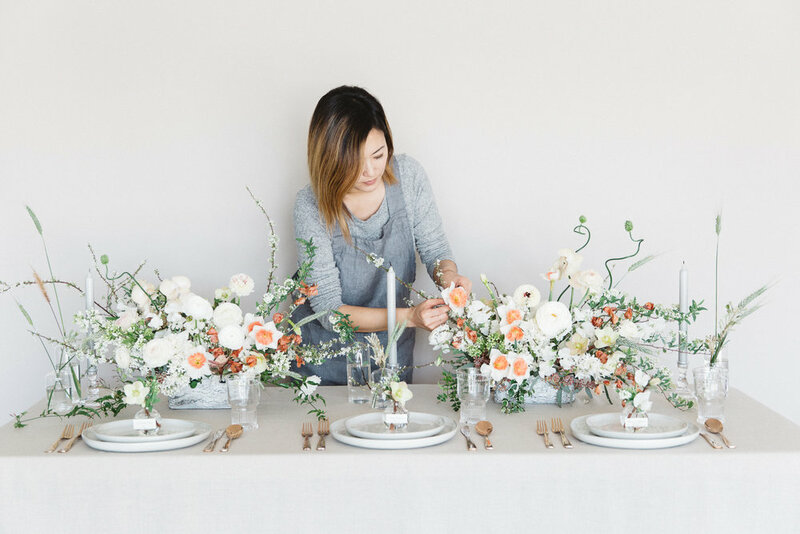 People think, “Oh, it must be so pretty and fun working with flowers.” But I don’t think people realize how much grunt work there is and how physically demanding it can be. It’s definitely not as glamorous as it looks and can involve some back-breaking, arthritis causing work. Once you bring back the flowers from the flower market, you start processing it - chopping all the stems and preparing all the buckets of waters. That takes about 3-4 hours. A typical Wednesday morning starts at 4 or 4:30 AM and I get to the flower mart by 5. The early fish gets the goods! I’m at warehouse for about 3 hours, scanning the whole warehouse for the best quality, best color, and best price. I drive back home and start processing them. By 1 or 2 PM, the flowers are then ready to be designed. I spend the rest of the day and all day Thursday and Friday designing and arranging the flowers mostly for weddings and sometimes Dohls (First Birthdays). Hannah's arrangements look natural. It looks like they were picked that way from the wild and just transplanted into a holding vessel. But this organic look doesn't happen haphazardly. It requires intentionally placing each stem by someone as meticulous and detailed as Hannah. It's like how master musicians, dancers, and craftsmen make things look so effortless. In this case, there were countless hours of back-breaking labor to create these works of beauty. I would not have thought to do an event in the hallway of a building, but Grace International Ministries church has a beautiful atrium that this family utilized to celebrate their daughter, Naomi's, first birthday. They had cute bunny hand towels as favors on the table (so practical, right?!) and the most delicious tasting desserts. The mom, Sarah, who is an artist handmade most of the decorations and made it look like a beautiful greenhouse with pink flowers. The dad, Aaron, emceed the event. He is funny and can really pace an event so the guests are entertained and engaged! Between the two of them, and the help of King Taco with the food (who doesn't love tacos! ), they covered the entire celebration! 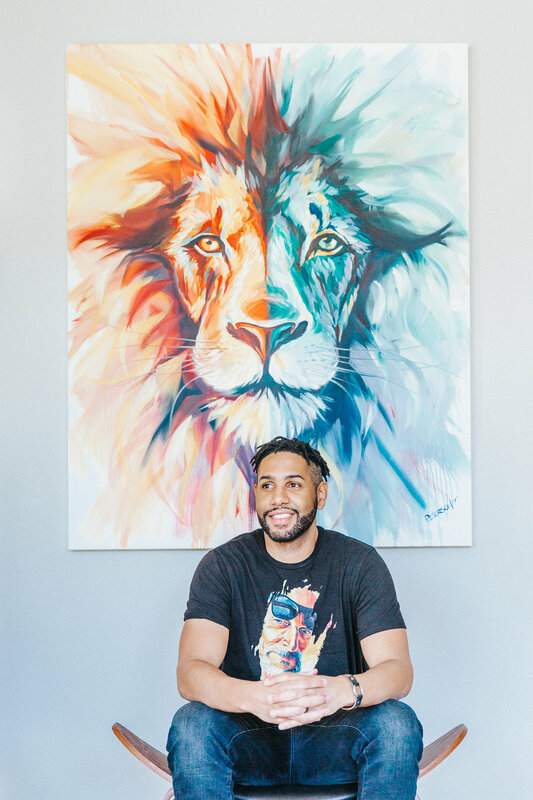 Meet Brian Peterson, a painter who started a passion project Faces of Santa Ana out of his encounter with the Screaming Homeless Man. Although Brian designs cars for Kia Motors for his day job, he finds a deep sense of purpose when painting. I feel the most alive when I’m painting. By alive, I mean the whole time I’m painting, it’s a battle. It’s not like “Whooo this is so fun~ I’m an artist!" It’s challenges and mistakes. And you work with the mistakes. 50, 60 % of my paintings are mistakes. And you work with 'em. You leave them there. You don’t try to erase ‘em. There’s no eraser with oil painting. And I think that’s like life. We can’t always tell if something is good or bad - we can’t discern everything. What do you with situations that life throws at you? And that’s kinda like how painting is. Oh that's not working, but let’s keep working. Let’s keep believing that the end goal is going to be amazing. And that goes with all of my paintings. It never looks good half way through to me. For Brian his faith also plays a core role in his creative work and what propels him to paint. For me, art is two things. Art is worship because when I paint, I feel like I’m connecting with God. So if art is a means of love, and love is the most powerful force in the world, then I think art has a lot of capability of changing hearts, lives, minds, governments, perspectives.... all that stuff. So I view art as love. What kind of “love” is Brian speaking of? Let’s get back to the Screaming Homeless Man. There really was a homeless man who really screamed regularly in his neighborhood. In fact, it was a such a regular occurrence that Matt named him the Screaming Homeless Man. “Oh, there he goes again” was the common response to the sound. But one night, Brian was reading Bob Goff’s Love Does on his couch. He heard the familiar screams of the Screaming Homeless Man, but that night, it was different. I was reading about loving my neighbor and what it looks like to love like Jesus. And those screams pierced into my heart. I thought “Man, that’s my neighbor. I don’t even know his name.” I told my wife Vanessa that I had to go meet him. Two days later I was on my way home from work on my bicycle. I saw him so I stopped and introduced myself to him. “Hey, my name is Brian. I’m your neighbor. I’m sorry for calling you the Screaming Homeless Man in my household. I’ve also driven by you a thousand times and I’ve never said ‘Hi.” So here’s that intro - ‘Hello.’ He told me his name was Matt. He moved here from Kentucky to be a musician and had been homeless for over ten years. I had no intention of doing anything with it. I just wanted to paint...something...again. And I thought that his face and his story were really interesting. They inspired me. He said, “Yes.” I posted it online and people were asking if it was for sale. Out of that one guy that God gave me eyes for, that’s how it came about. Since then, Brian has painted numerous portraits. With the proceeds of the sale of the painting, he helps the subject of the painting with their specific needs. 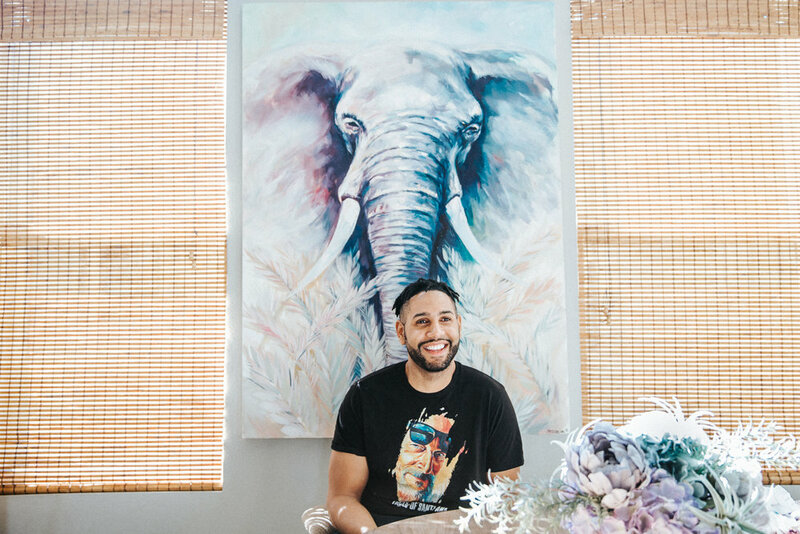 While he has been painting for the past three years with a mission to give personal dignity and value to those who feel invisible, he is now discovering his own worth as a painter. I think I’m just discovering my worth as an artist. I could never price my art to sell. How much do you charge for a piece of your art? FOSA (Faces of Santa Ana) has helped me break this barrier because I’m charging money to help someone. So it makes it easier. Previous to doing this project, I would’ve never been able to list a painting of mine for $2500. Impossible. But because I’m helping other people, it’s justified in my heart. But recently, my wife’s been trying to help me understand my worth as an artist. I’ve had these walls put up where I don’t believe that my work should be worth as much as she thinks it is (and others). I’m learning that God is showing me who I am to him. He has given me this gift and so I’m learning how to step into this role to see myself as God sees me. There are a lot of paintings I’m doing on the side that aren’t FOSA and I’ve been slowly seeing my value. Describe something you LOVE about what you do. I love that my art influences people. I love that it’s not just a pretty picture hanging on a wall that’s technically sound and perfectly painted. I love that when people look at anything, whether it’s lines on the faces or strokes - people see stuff in it. Because I’m creating art with the Spirit, I believe that there are supernatural things that He does with other people viewing it. And that’s the favorite thing - waiting for those texts or Facebook messages from someone who came to a gallery or something. I love seeing how it is changing and impacting people. During my visit, Brian was working on his latest painting of a couple. 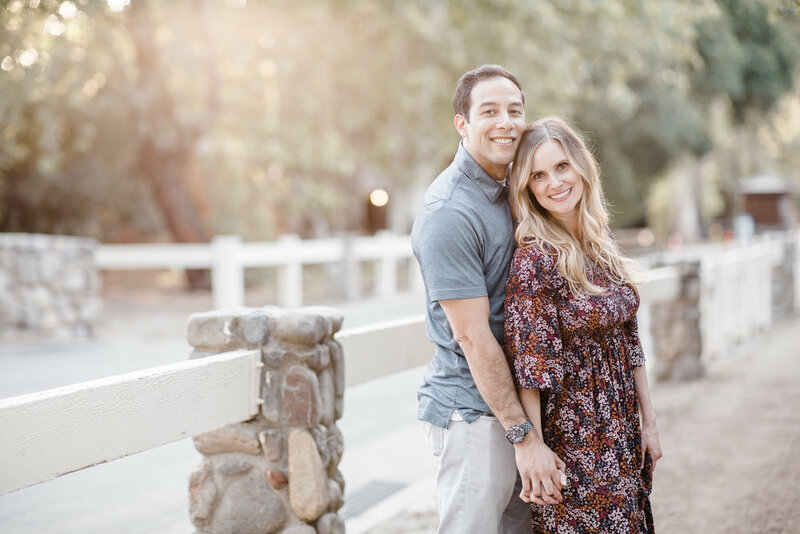 But for the first time, this portrait is going to be a joint effort from Brian and his wife Vanessa painting an interracial couple like themselves. Brian is painting the man and Vanessa is painting the woman. Brian uses a "one and done" technique where he creates a stroke with his brush and leaves it. Vanessa uses a different technique where she blends the colors together. "And that's ok," says Brian. 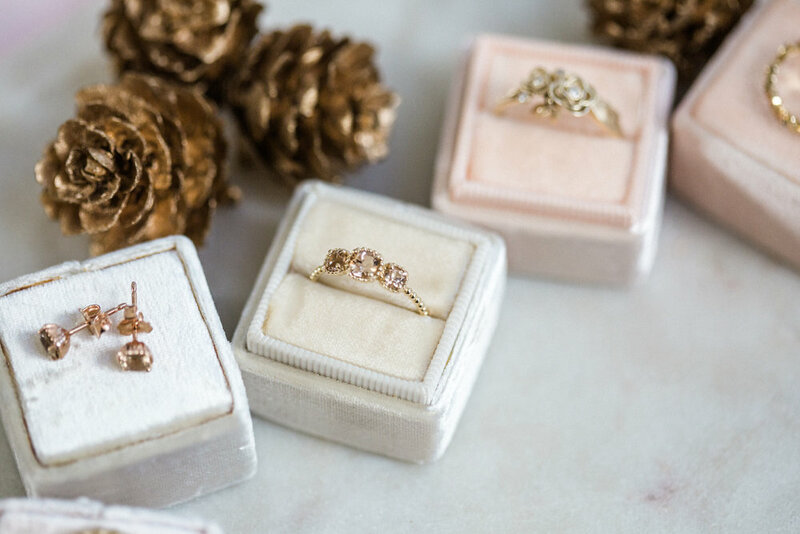 She started her business, Angelique Ink, in late 2009, when her husband introduced her to Etsy. 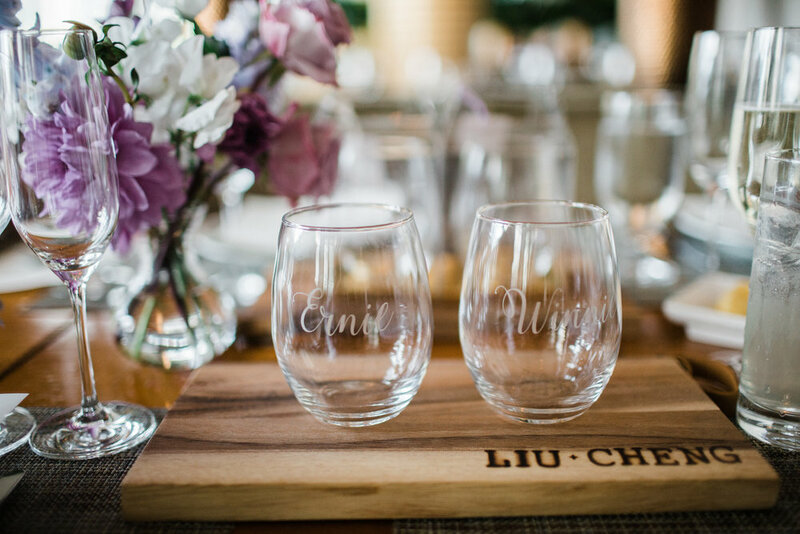 Now she teaches calligraphy workshops; creates custom invitations, stationary, wall murals, logos; and sells a line of products online that all incorporate hand-written calligraphy. Here is Angi. My creative process varies depending on the type of project. Most of the time, it starts with gathering the information from the client. Then, I sit on it for a while in my head and let it marinate. Then at some point, I think “Oh my deadline is coming up” [laughs] and I’ll just start writing. I have some kind of a blank canvas in front of me and lots pencils and pens and I’ll just start writing. There’s no rhyme or reason to it. I’ll often write the word or phrase. I jot down things that come to mind and it looks like a bunch of junk on paper. But that’s what gets the wheels turning. And then I usually put that down for a while and then I come back to it in a couple days and I’ll refine the work from there - looking for things that match or go together, looking for spaces and letters that read back into each other. I like traditional styles, but find that too many rules impede my creativity which I like about my work and gives me a distinctive style. So I stay away from being too tied to traditional forms of calligraphy in order to have the freedom to be creative. Breaking away from traditional scripts can sometimes look ugly or careless, so my goal is to makes these deviances look beautiful and intentional. You embrace the imperfections. The lines move in a free and unique way like a song and dance. Even though it’s not perfect in typical calligraphy standards, for me, there’s more room to connect emotionally with something that is relatable, emotional, free and unique. I think that people can have emotional reactions to any art work. In calligraphy, it can be through the way the lines look or the flow is happening or the placement of a word or line. I think my work has a certain poetic flow to it. [Yes! Her lines and strokes make the words come to life!] I do get a lot of inspiration from poetry and thinking through the emotion behind words and how that’s expressed. I recover from creative block by going to the garage and just working with my hands in a different way than calligraphy. So shaping a piece of wood or building something, and seeing how much detail and intricacies are in a small piece of wood - even the grain in wood - can be inspirational to me. One of the challenges for creatives is the comparison game. Everyone struggles with wanting to be better or wanting to be like someone else. And it's hard when you personally want to grow in your craft and are not feeling like you’re making progress. For me, when I start feeling inadequate, I don’t spend a lot of time on social media for my personal sanity. I sit down and do the work that’s in front of me and not worry about what other people are doing. Social media can be a great tool. I do use it. It's helped my business a lot, but it’s a black hole so I set up strict boundaries for myself so I don’t get caught up in it. It’s a great way to connect with people. It can be a very affirming environment, but you get addicted to the affirmation. And regardless of how social media makes you feel, you just need to keep working and creating. She is constantly writing phrases and words. So she’s come across countless wise and profound sayings. But on her own body, she’s chosen to ink, “We’re better for all that we let in.” Thank you for sharing your open spirit that embraces people and opportunities! 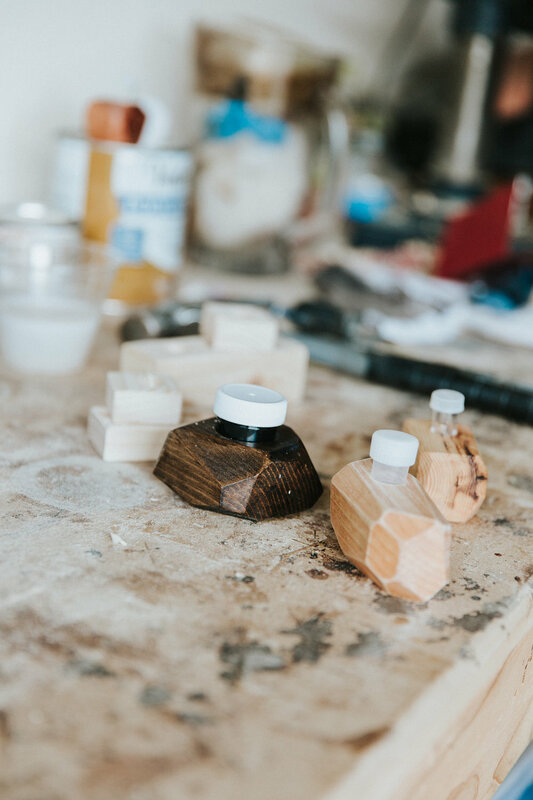 Josh Martin hand-shapes surfboards from polyurethane foam, EPS foam [the foam you see in TV packaging], balsa wood, and giant sequoia wood that fell in storms and has been legally harvested. Hobbyist surfers and professional competitors, such as Rachael Tilly, order custom-made boards from Josh's shop - Martin Shapes. Shaping runs in his family. His father, Terry Martin, is a legend in the surfing world. He hand-shaped roughly 80,000 boards in his lifetime and made a living just from shaping boards. When his father started shaping, they used drawknives to rough shape the board. These days, Josh says that about 95% of the boards sold today are mass produced from CNC machines and computers. Here is his story. I don’t use CNC equipment or a computer. Everything is handheld. I do use power tools but I use it with my hands. The guys who used drawknives would say using a planer is cheating, but in today’s standards it would be considered a hand-shaped surfboard. I started shaping boards in 1986. In 1988, I got an order from JC Penny to build these display board. It was less than half of what I would normally get paid at that time to build a board. I was really hesitant about taking the job, but when I asked my dad what he thought about it, he said that I should take the job. “You have to make 650 of these and they all have to be the same. You’ll develop and a system and an approach to replicating a surfboard. The shaping tool will be an extension of your arm. You’ll basically learn how to be a human machine and just replicate stuff." I took the job and was grumpy about it, but I completed the order. I was 19 years old. Now, when I come down here, it’s just really fun [huge grin on his face]. The planer is a part of me. Am I systematic? Am I artistic? This is an example of being really artistic [as he points to an atypical board called a "hot curl"]. There is no other surfboard like that. I made that yesterday. I wouldn’t be able to do this efficiently if I didn’t have those good systems and habits in place. It allows me to have the freedom to be artistic in my approach. So the two come together. This board doesn’t have a motor. The surf is the motor. Once you buy the surfboard, it’s free. The ocean’s free. The waves are free. You get to go out participate in nature, with the energy and the ocean. The wind and the water traveled from the other side of the world. You see the wave being pushed toward you, and you turn around, propel yourself and catch and participate with this energy… and it’s all free. When you make a good shape, that has a lot of shape, they fit down in the wave and you can really feel it catch the wave root of energy. It’s just a really fun way to experience... God’s creation. It’s not so much about the product and shape. It’s about the person. I get all these different people and they have all these different experiences. Like there's Rachael Tilly who loves to compete. There are doctors who like to surf. And other people just like to be free from responsibilities and just travel. You get all these walks of life. To me shaping is just a connection point for the people. I’ve had people ask me, “What about Costco? They sell those Wavestorm boards for really cheap, $100. Isn’t that competition? Isn’t that gonna put you out of business?” I go, “Nahhhh.” They might sell a hundred of those boards down there and two or three of those people fall in love with surfing and eventually, they come to me. [laughs] To me, they’re just advertising, really. And again, it comes back to the people. 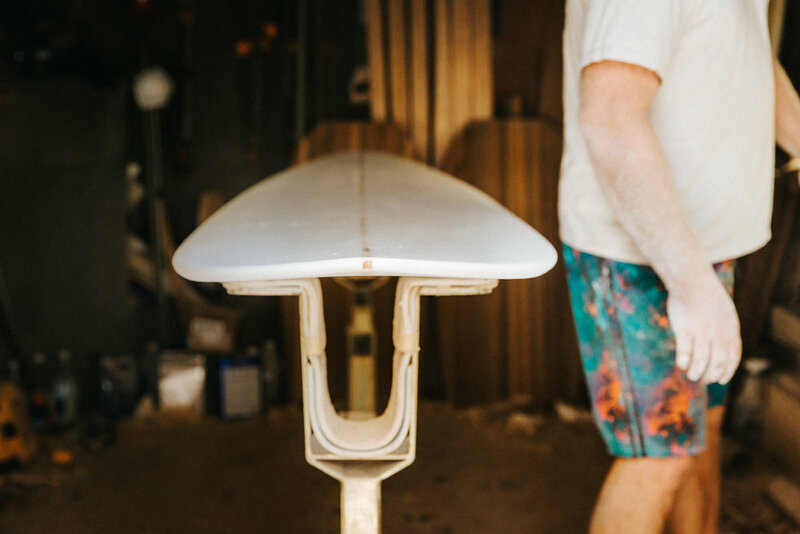 What do you think it takes to be a surfboard shaper? I think you have to be the kind of a person that likes to create. There are people that take their car into the mechanic to be fixed. Then there are people who like fix it themselves. I’m the type of person who’d fix their own car. I’m interested in how it works, why it works the way it does. But then, I also see other people with a different personality type and it works for them. For me, I like to build stuff. I build shift knobs and jewelry with any leftover resin I have laying around. I made chopsticks out of the sequoia after hollowing out a board. I don’t like to waste anything. As I hung around the shop, waiting for Josh to finish planing the board, a customer came by. I said, "You can go ahead," as if I was letting him go ahead of me in line to see Josh. This older gentleman with a white curly beard (maybe he's a Santa Claus of surfing!) leaned over to me and said, "You don't disturb an artist at work." Ah, of course. We both waited until the planer was silenced to chat with Josh. While we were waiting, Santa told me all about the board he had ordered from Josh - the hot curl. 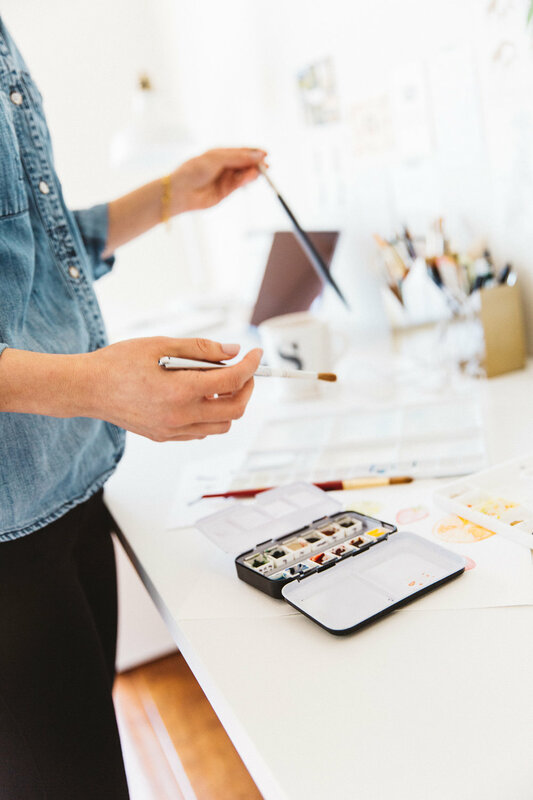 I sat down with watercolor artist and designer, Susan of rae + lily in her home studio. Here is her story. I started art classes when I was only 5 years old, but my educational background and career is in design and architecture so I associate a lot of my identity with being an architect. But since starting rae + lily, I currently use watercolor and digital software as my medium to design and create things. I like how using the combination of traditional paints and digital software gives me a lot of flexibility to play when designing. I left my corporate job because of health reasons. I enjoyed being an architect, but believe it or not, my last job was pretty stressful. After leaving, for the first couple months of 2017 I was in and out of doctor visits. To keep myself busy with something to do and to find an identity again, I picked up watercolors and started sharing my work. Because I associated so much of who I was with what I did before, it was nice to have a sense of purpose and a community of people - even if I only knew them through the internet! I had a background in art from when I was very young through college so it wasn’t too hard to collect supplies I had leftover from college and start painting. I was actually really shy about sharing my work and decided to join this 100 day challenge. I challenged myself to work with watercolors because it was a medium I hadn’t worked with before. It was something I wanted to try and it was nice to have a daily routine around it. Somehow along the way during that challenge, a small business was born. I always had an entrepreneurial spirit though. I had tried different things before, like starting a food blog, doing photography, but I realize now I think I was scared and always stopped myself because I didn’t really want to put my work out there. This time, I decided to really give it an earnest try and be braver about sharing my work and some amazing things happened as a result. The first time someone wanted to buy an original painting, was a real breakthrough for me - and they were in Italy! I couldn’t believe that someone actually wanted to buy something I painted. That’s when I knew I could keep painting and maybe it could become something that I could call my own. Finding inspiration and getting into a creative mindset is sometimes challenging. 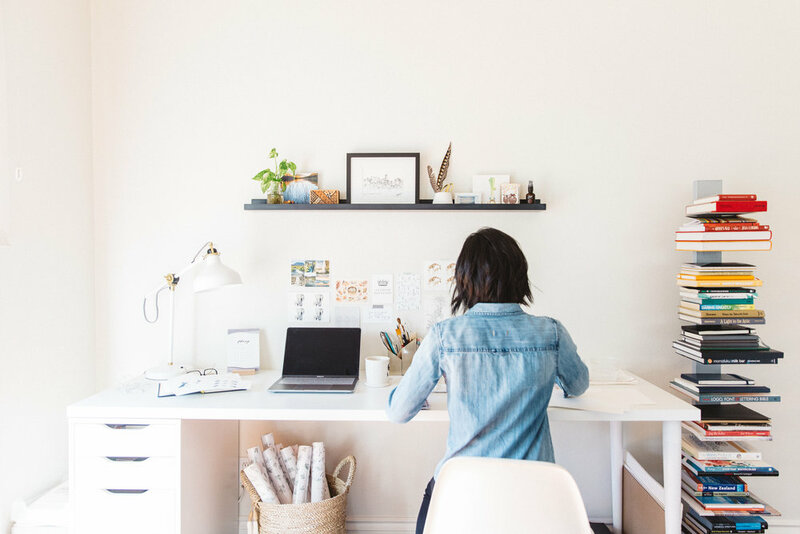 When you’re a creative running a business, you end up working on the business component 80% of the time. 20% is the actual fun, creating part of it. Often times, I let the 80% get in the way of the 20%. I actually don’t mind the business side of things - doing administrative tasks, corresponding with people, etc. But I need to remember to give priority to creating and really set aside time to do that. I have to remember to allow myself to have fun and be creative. I definitely recommend joining a challenge or giving yourself structure by setting small goals to complete a little at a time when it comes to creating. It’s not so different than any other goal you want to accomplish as big things can be done by making a little progress everyday. The 100 day challenge is a great one and can feel overwhelming but if you approach it a day at a time, you’ll get to day 100 and wonder what to do after it’s over! 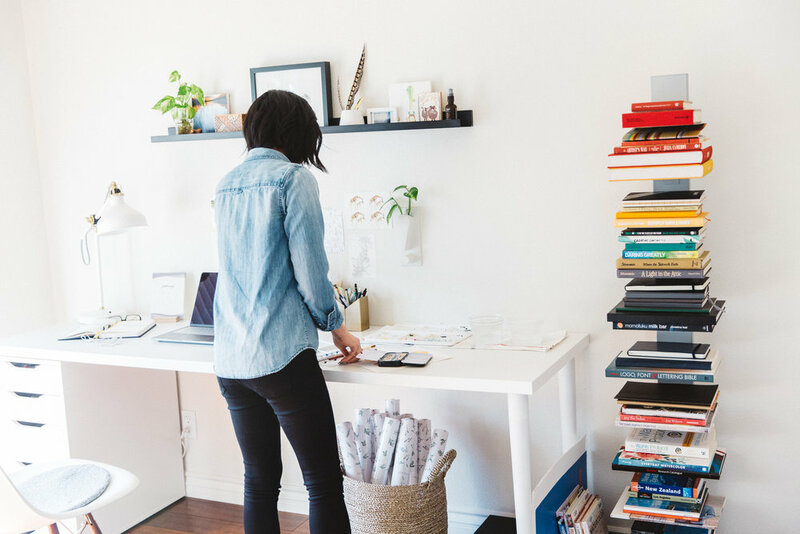 Another great byproduct of making time to create is actually generating work that you can use for your business or personal creative projects. Sometimes this can happen unintentionally and sometimes on purpose. I also think taking online courses is a nice way to make time to create because they keep you accountable and you learn new things! I’m taking an online course for watercolor sketching right now and it’s been really fun. For me, my creative process starts with cleaning. I need to clear my space so it’s ready to use. I also get a lot of inspiration from traveling and being outside. For example, the puffins piece that I’m currently working on making into a print was inspired from our trip to Iceland last year when we went looking for puffins but only saw two or three. My favorite part about watercolors? The unknown. 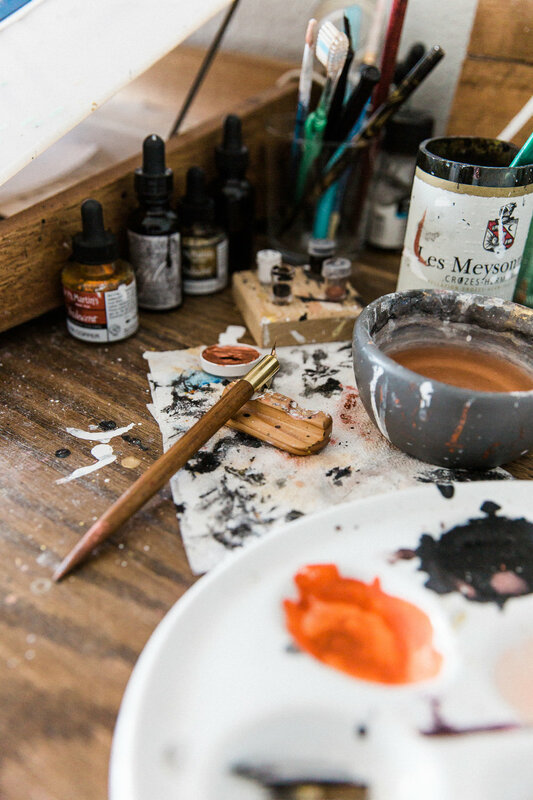 With watercolor, it’s unpredictable and unexpected - the way the water and colors move and mix together. Sometimes you think you’re going to hate it, but you could end up loving it after it’s settled and dried. You want control it, but it does the best things when you let it do its thing. Being pleasantly surprised by what you end up with makes it fun to work with. What would I do differently in my journey? I’d be braver earlier on. Susan was extremely gracious and generous during my visit, which is evident in her business too. Her work is clean and simple, but at the same time, the details are not ignored. In fact, the details make you stop and say, "Woah~" while admiring the different gradients of color. 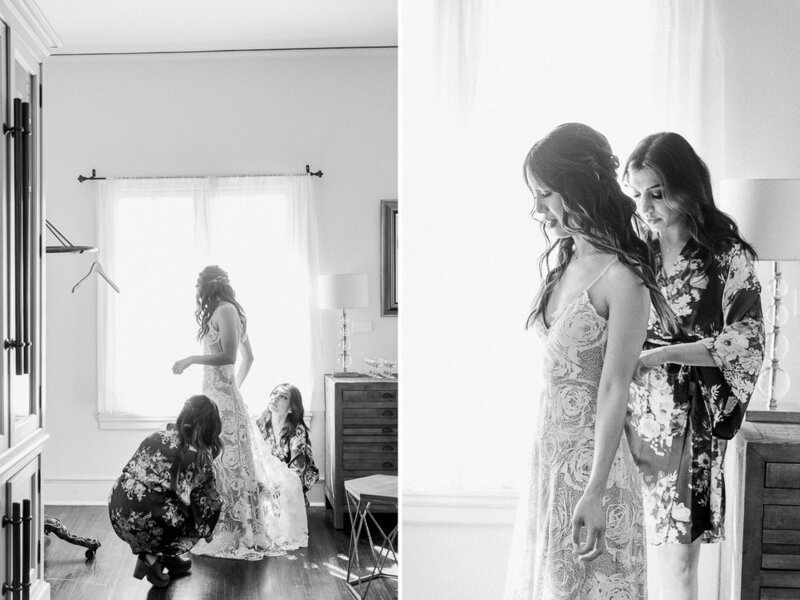 All the best to Susan and rae + lily! Here are some comments that Joshua's mother noted for her son's first birthday celebration! * I was inspired to do a camping theme for Joshua because he is a typical boy in many ways - SO incredibly curious, adventurous, experiential, and active. From the moment he wakes up in the morning, he does not sit still. He always has a sense of wonder and is busy touching and experiencing the world around him. It's hard to keep up with him sometimes but I love this about him and want to nurture and grow his curiosity. It goes hand in hand with our hopes for Joshua - we hope he can grow up to be strong and courageous and full of joy as he lives the adventure of his life just like the Joshua of the Bible. 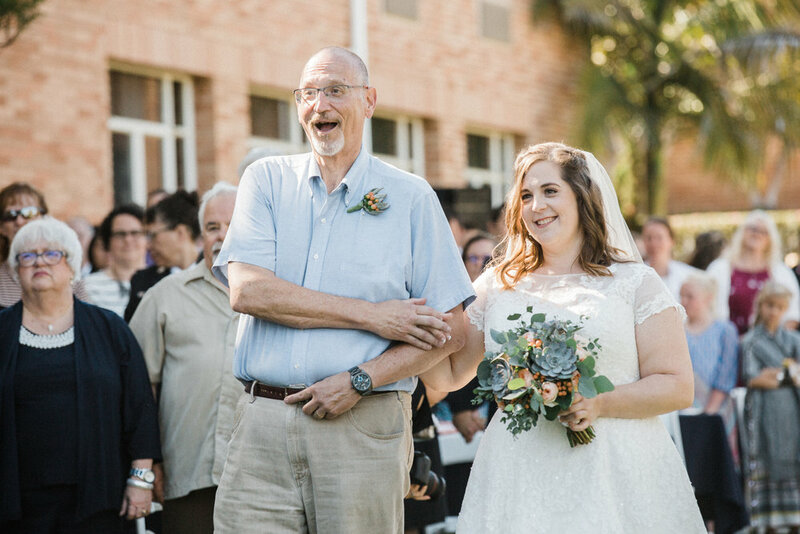 * We were so grateful for Mike's parents who flew in from Philadelphia just to be part of the dohl. 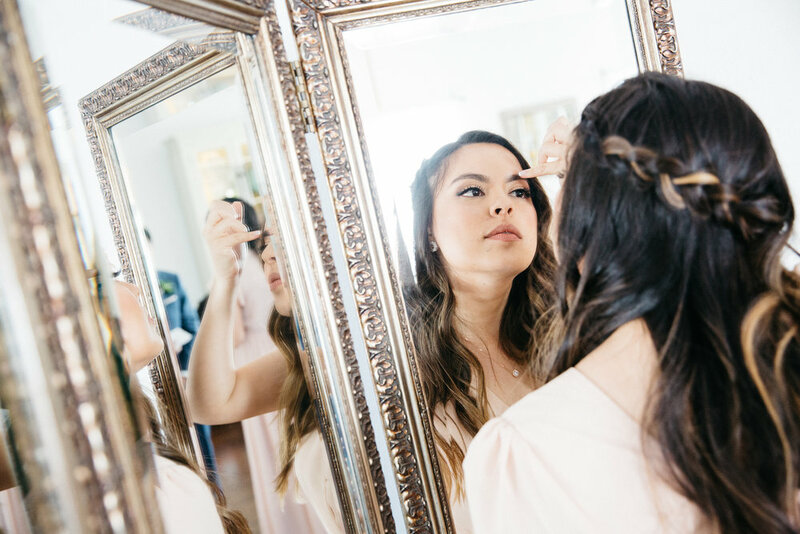 Serving Orange County, Los Angeles, Southern California & beyond in lifestyle, brand + wedding photography. Telling stories of human bonds, celebrations, passions + creativity. Helping creatives fulfill their visions for branding. In-home sessions, outdoor sessions, on location events, and studio sessions.